If day one of London Fashion Week Men's was about a resurgence of masculinity, the second day was a return to boyhood. Phoebe English kicked things off on Sunday morning with a collection that focused on hard-wearing separates. There were many layered, Nehru-collared jackets in gabardine, waxed trousers with legs wide enough to conceal waders beneath them and the kind of black galoshes you might see fishmongers sporting on an early morning in Billingsgate. There was an understated innocence to the looks English showed, a feeling heightened by the way the models were grouped together: like boys crabbing at Camber Sands. Lou Dalton, a LFWM veteran, showed in a brand-new office space on St James's Market. Models wearing cosy velvet parkas in rich wine shades and artfully bobbled jumpers were perched on artificial boulders. If the boys were crabbing at Phoebe English, then they were rock pooling at Lou Dalton. "This collection was all about me growing up in Shropshire. The looks are inspired by the kids I used to really want to hang around with," Dalton told GQ. "It's about rawness and youth. I love the earthiness of it all. It reminds me of my own childhood." The MAN show, as ever, consisted of three collections presented by three young designers on the brink of greatness. The standout collection was from Rottingdean Bazaar, where design duo James Theseus Buke and Luke Brooks showed a series of looks produced from found objects: badges, mirrors and dartboards. Art school is now in its second season for MAN, and the label showed a collection of genderless dresses, skirts, slips and catsuits, all of which were worn by non-binary models: friends of the designers. The clothes on show looked like outfits many of the men in the audience (and beyond) might have wanted to wear when they were little boys, but perhaps weren't always encouraged to. Christopher Raeburn showed a collection that looked ready to be packed for a school trip to the Isle Of Purbeck. Animal-emblazoned intarsia wool scarves were teamed with rainbow-hued cagoules, oversized backpacks and cartoonish mittens. At Kiko Kostadinov, the designer (who is also the creative director of British outerwear brand Mackintosh) showed a collection of deconstructed shell suits in pastel shades, body-con security pouches (not dissimilar to the ones your parents would have made you wear on your gap year) and thick-soled hiking boots. To Alex Mullins, who presented his first runway show in the BFC show space this afternoon. The designer's oversized grey suits (an enduring trend) looked like school uniforms that some of the models could have done with a few more years to fit into. Stacked-sole sneakers looked comfortable and sports day-ready. 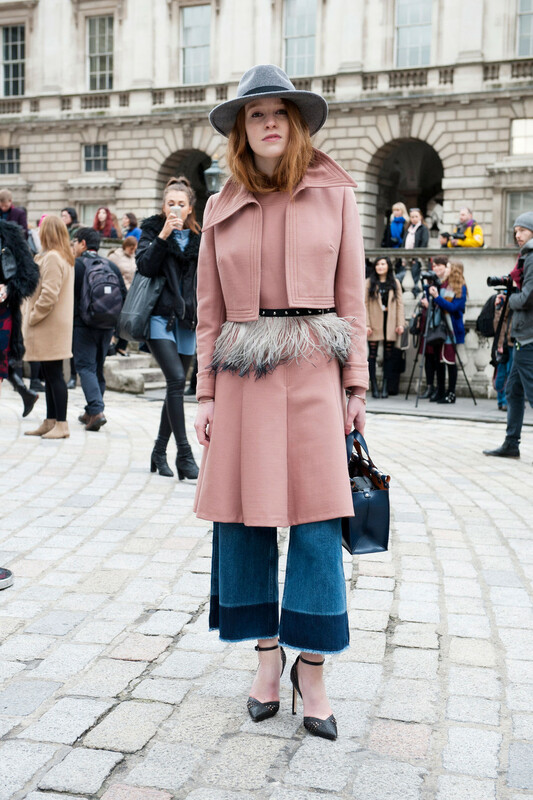 Matte, long-line puffa jackets (the kind that Tommy Hilfiger made cool in the Nineties) also felt modern. At Astrid Andersen, the Danish designer showed perhaps her most accomplished collection to date. The mood here was less "school days" and more "what you'd like to do when you grow up". Some models came dressed as cowboys, bedecked with ten-gallon hats; others came furnished with silk jacquard dressing-gown coats, reminiscent of the ones worn by headlining boxers before a big fight. The best bits, however, were, as ever, the simplest. Brocade tracksuits, brushed cotton overcoats, hoodies in contrasting checks and fleece-y towelling cagoules afforded Andersen's collection a new depth. It was at Kent & Curwen, however, the heritage brand part-owned by David Beckham, that the youthful vigour of the day reached its, ahem, climax. The label's creative director, Daniel Kearns, teamed up with cult photographer Perry Ogden to produce an exhibition of photographs that showcased the brand's AW18/19 collection. With a luxe-y PE kit-vibe (enriched by the fact the collection was modelled by "real" people, including a junior member of the Repton Boxing Club), there were football scarves, embroidered bomber jackets, emblazoned singlets and sweaters finished with the label's red appliqué rose. "This collection has taken us in a new direction," Beckham told GQ. "We want to be a multigenerational brand - for your age, my age, my son's age," he continued. "Perry [Ogden] has captured raw, young talent in a perfect way with his photos. We're really proud of the exhibition and the collection." When GQ asked Beckham to name his key pieces from the collection, he said, "I always struggle to pick my favourite bits. I love the football scarves, the sweaters and the short jackets... The bombers with the badges and the roses are great, and they're the things the customers love too." Sunday's final show (at time of writing) came care of the brightest young thing of a youth-focused day, Grace Wales Bonner. A considered counterpoint of nautical smocks, Victorian schoolboy frock-coats and good old-fashioned suits, this was traditional tailoring with a contemporary twist. Immaculately cut and pin-sharp, if fashion houses were schools, Wales Bonner would be Eton College... or more likely, Alleyn's. And this collection? The class of 1892. The fashion buzz-term for the past three seasons has been "gender fluidity". Alessandro Michele splattered onto the scene in 2015 with his colourful post-gender collections for Gucci (who'd have thought kangaroo fur-lined mules would have been the hit men's shoe of 2016? ); Will Smith's son Jaden wore a dress in the SS16 Louis Vuitton womenswear advertising campaign; and Jill Soloway addressed the issue of transgender politics with sensitivity and prescience in Amazon's hit show Transparent. 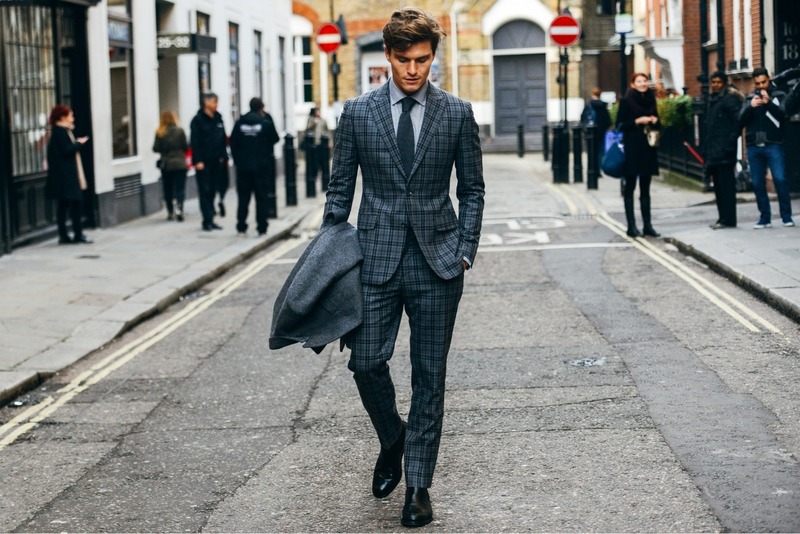 Interesting, then, that today, on the first day of London Fashion Week Men's, the mood had a hotly masculine edge. At John Lawrence Sullivan, angry-looking models stormed the runway in black leather trousers, heavy tread-cowboy boots and worn-out rodeo vests. Elsewhere in Sullivan's (very accomplished) collection, heavyweight corduroy western shirts and oversized suiting resulted in a look that was somewhere between furious Berghain doorman and opioid-addicted ranch hand. The intense manliness of this opening show was mirrored elsewhere. At Danish brand Tonsure, Bon Jovi-style leather trousers were teamed with patent leather macs, hardy donkey jackets and outsized grey tailoring. At Edward Crutchley, the designer teamed his carpet coats and silk pyjamas with black leather sneakers that had an orthopaedic look. The menswear trend for salt-of-the-earth clothing continued at Tinie Tempah's second collection for his brand, What We Wear. Slim-cut tracksuits came teamed with many pocket worker jackets, which looked ready for a day on a building site. There was more of the same at Danish brand Wood Wood, which showed in London for the first time today. Heavy-soled sneakers were worn with weighty top-stitched denim jackets, lumberjack shirts and fleeces - the look was similarly stout at Band Of Outsiders, where thrift store intarsia knits were worn under belted trench coats and denim jackets - and the models, who skated onto the glacial runway of the Somerset House ice rink, looked like extras from the Coen brothers' 1996 film Fargo. It was GQ favourite Oliver Spencer, however, who turned the volume on the bloke dial up to eleven. Models wearing oversized corduroy and covetable velvet suits with vests and T-shirts swaggered out to Roxy Music's "Love Is The Drug". In addition to Spencer’s trademark Nehru jackets, deconstructed topcoats and wide strides - which he always does so well - the models also came furnished with heavy belcher chains, long gold medallions and a heavy dose of attitude. Spencer even sent some female models (Daisy Lowe, Catherine Hayward and Jade Parfitt) down his runway. 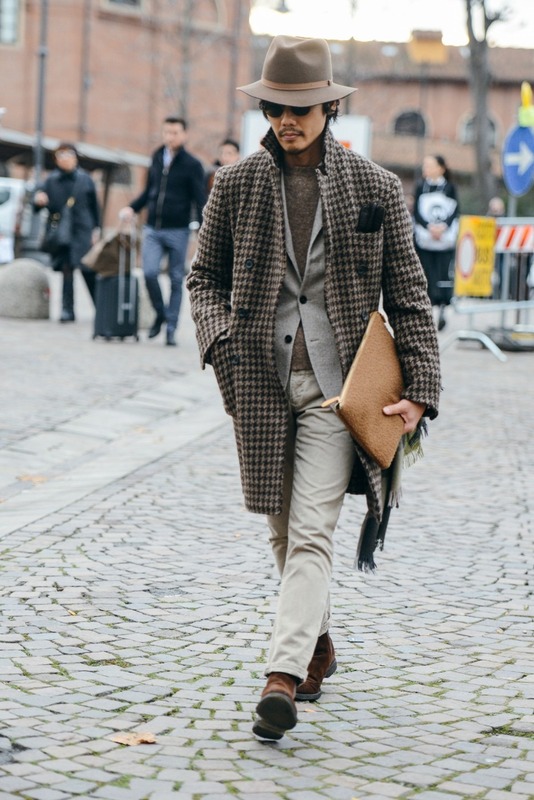 He put them in full men’s looks and heels, which felt like a bold move in the current climate. "With this collection, I was referring back to a period in the Seventies when there was a lot of cultural and social movement," said Spencer. "And that felt very similar to the moment we're in right now. I wanted that to come across in this show." In the recent wake of the aforementioned swell in gender's fluidity, menfolk haven't fared too well: major players in Hollywood and beyond have been very publicly accused of sexual misdemeanours, there's a misogynist in the White House and the gender pay gap has been laid bare. Whether today's shows represent a collective attempt to demonstrate that dressing like a man in the traditional sense doesn't necessarily make you a monster, or whether they simply address the need for hardworking clothes in a challenging landscape remains to be seen. One thing's for sure, though: there wasn't a furry slipper in sight.